Together with mergedroid, we have developed a tool to analyze your repos and find how many past merges could have been automated. In fact, if you visit mergedroid today, it will send you to the analyzer because we are gathering some stats before we release the merge bot. Check a sample report from a public repository here. Can I use mergedroid today? It's not still available for everyone since we want to test it in batches with users before we go live publicly. It's in beta, so we still haven't figure that out. Most likely, it will be something based on the number of merges it solves, so you only pay for when it really helped you to save you time. It's quite simple. 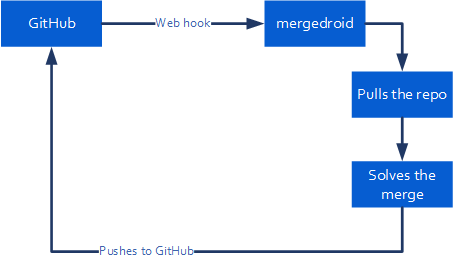 It installs a webhook in the GitHub repos you choose (public or private) so mergedroid is notified each time a pull request can't be automatically merged by GitHub. 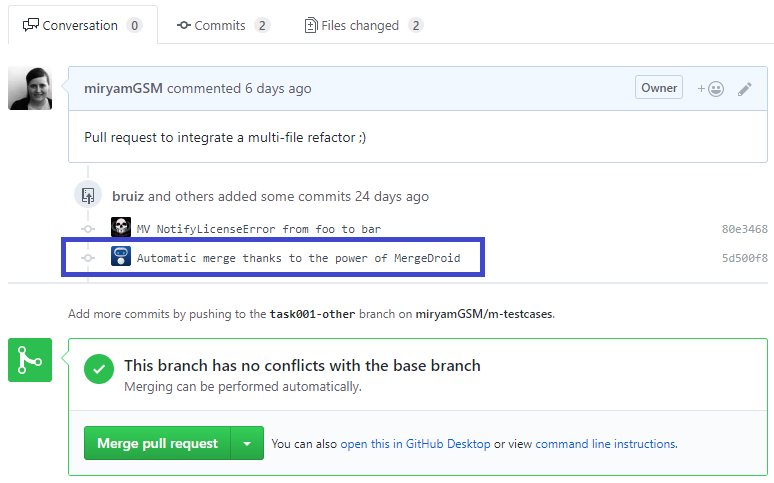 When that happens, mergedroid pulls your repo, (that's why it asks you to grant access to it), tries to solve the merge with semantic tech, and if it succeeds, it commits the merge result and pushes back to GitHub, so your pull request gets updated. Then, GitHub will be able to automatically merge the updated pull request. How are the pull request conflicts resolved? But, it can't be merged to master because of manual conflicts. To do that, mergedroid uses our entire merge tech, including Semantic and also cross-file semantic merge resolution. (Check this video for more info). If it can solve the merge without manual intervention, it will commit locally and will push the updated branch to GitHub. Then, GitHub will be able to automatically merge the pull-request without any manual intervention. mergedroid will send an email to the author of the pull-request notifying them whether it was successful or not. Merge down instead of rebase? As I explained above, mergedroid "merges down" the master branch into pull-request. Another option will be to simply rebase the pull request. We will consider this in the future depending on user feedback. What we found so far running "merge replays" in public repos is that between 16 and 30% of branches that currently need manual intervention can be merged automatically by mergedroid. And, it happens in repos where authors are trying to avoid complex refactors because they know merging the code later can be a nightmare. We expect this number to increase as soon as more teams adopt mergedroid, semanticmerge and gmaster. Contact us if you have any questions about how mergedroid can help you or if you want to give it a try. You can use @gmasterscm on Twitter or simply drop us an email to mergedroid@gmaster.io.